Next week, Russian vessels are expected to be making yet another scheduled visit to the Philippines. The engagement will spotlight the ongoing activity within the development of Russia-Philippines defense ties and naval relations more specifically under Philippine President Rodrigo Duterte’s perceived “pivot” to Russia as part of his wider independent foreign policy. That has continued over the past year or so as well. A case in point was the first-ever port visit of Philippine naval vessels to Vladivostok in Russia in October, which was viewed as a boost for ties. Interactions also got underway early on in 2019, with three Russian vessels arriving in the Philippines for a goodwill visit in early January in what was the first public defense engagement between the two sides to kick off the year. There has also been ongoing conversation about the inking of a Russia-Philippines navy pact, which, as I noted last week, is now expected to be inked later this year. Next week, the defense aspect of the visit will be in the spotlight again with another scheduled visit by Russian vessels to the Philippines. Three Russian vessels will be in Manila next week as part of a scheduled five-day goodwill visit. The goodwill visit, which will start on next Monday, will involve two large anti-submarine ships – Admiral Tributs and Vinogradov – and one large sea tanker Irkut. Per the Philippine Navy (PN), the visit will involve several engagements, including a customary welcome ceremony and meetings, exchanges, and activities between personnel on both sides. At this time, no further specific activities have been detailed, though such events usually involve a range of interactions such as ship boardings, tours, and cultural events. 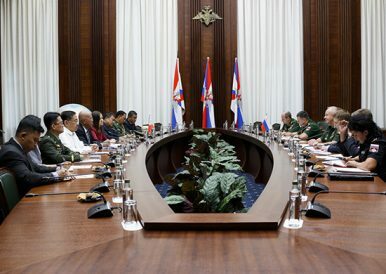 Nonetheless, how exactly this plays out next week will be interesting to watch not just for additional details, but also to assess how its significance should be understood amid other developments in the Russia-Philippines relationship more broadly as well as the holding of other events in the Philippine defense space such as the ongoing U.S.-Philippines Balikatan exercises. A recent meeting highlighted the counterterrorism dimension of a limited but growing defense relationship.